I have been BLOG’ing a lot about Campania region (means “Happy Land”) of Italy (southern Italy including Naples, Capri and Amalfi Coast). 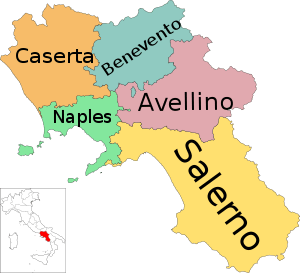 This region is known for their lemons and lemoncello and mozzarella di bufala (mozzarella made from buffalo milk instead of cows milk). This region is also known for some very good wines. When I travel in Italy or France I always order a liter of house wine. It’s cheaper and very good. Wine spectator says the wines of this region are great. The most famous is Aglianico, the grape behind the region’s two most famous and respected red wines: Taurasiand Aglianico del Taburno. Aglianico was introduced to the area by the Greeks and later cultivated by the Romans. If you haven’t tried these wines, you should. Exploring different new wines is a soothing and pleasurable thing to do. Eat well, enjoy wine and be happy! When in Campania tries these and other local wines at any trattoria or Enotecca.